The history of the prestigious Department of Neurology, Postgraduate Institute of Medical Education Research, Chandigarh and of its illustrious faculty is presented. The outstanding work of the faculty and staff of the department through the years has been entirely responsible for the high stature that the department has achieved in the international arena of Neurology. It gives us great pleasure to write the history of the Department of Neurology at Postgraduate Institute of Medical Education and Research, Chandigarh, fondly known as PGIMER, Chandigarh. History matters as in reality all of us are living histories. Cultures, languages, religions and traditions, which we are experiencing, were all created in the past. History is a great teacher too. It is only through history that we learn about our glorious past and what needs to be done to maintain this glory. It is a common phrase that “history repeats itself,” and if we study the successes and failures of the past, we may, ideally, be able to learn from our mistakes and avoid repeating them in the future. 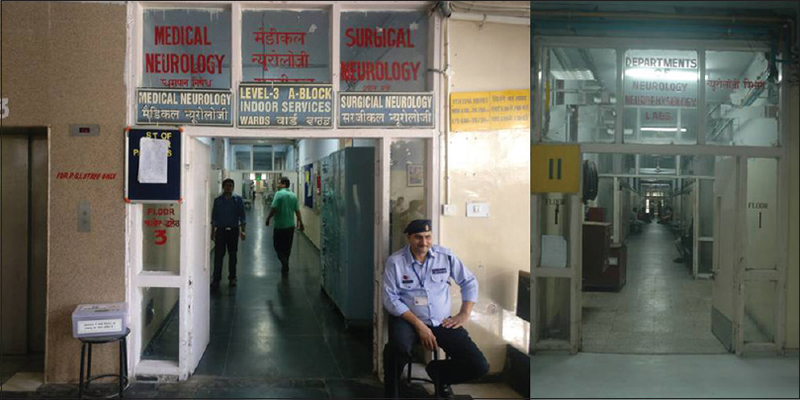 The Department of Neurology at PGIMER, Chandigarh has a unique standing among the Neurology departments in the country. In this article, we take the opportunity to pay our gratitude to our teachers. They planted the seedlings and nurtured the plants which are now bearing fruits and providing shade to all of us. We take pride in bringing forward the travails of those who have struggled hard and dedicated their efforts towards the building and uplifting of the department. It is through their firm determination, tireless efforts and willpower that the department has attained the stature of being ranked as one of the best departments of Neurology, not only in India but also in the world. The institute remains indebted to its founders who include some of the greatest teachers of medicine of all times, including Dr. Tulsi Das, Dr. Santokh Singh Anand, Dr. P N Chuttani, Dr. B N Aikat, Dr. Sant Ram Dhall and Dr. Bala Krishna. It was their tireless efforts which laid the path of excellence for the institute. 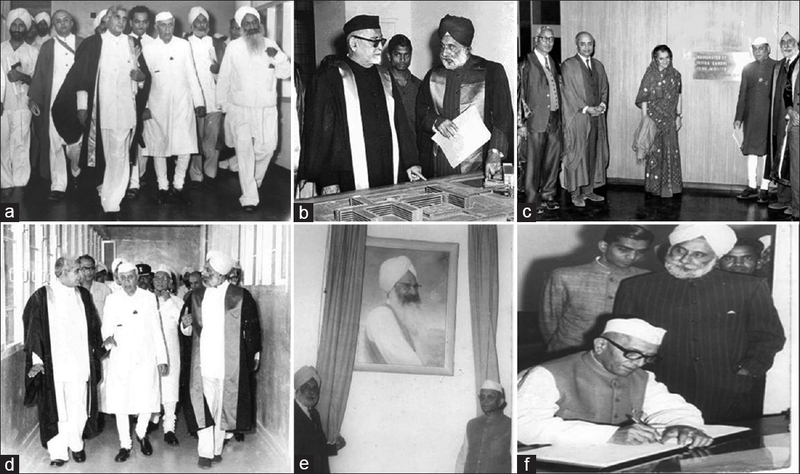 Some of the proud moments in the history of the institute are illustrated in [Figure 2] and pictures of Nehru Hospital then and now are shown in [Figure 3]. Subsequently over a period of time, several new centers of academic excellence were started within the premises of PGIMER, Chandigarh, including the Advanced Pediatric Center (inaugurated by the Honorable President of India, Dr Shankar Dayal Sharma on 22nd May 1997), the Advanced Eye Center (inaugurated by the Honorable Vice President of India, Shri Bhairon Singh Shekhawat on 18th March 2006), the Advanced Cardiac Center (inaugurated by the Prime Minister of India, Shri Manmohan Singh on 3rd November 2009) and the Advanced Trauma Center. The vision of the former Director, Dr. K K Talwar [Figure 4] was instrumental in starting many of these centers of academic excellence. Under his leadership, most of the departments of PGIMER as well as existing Intensive Care Units underwent complete overhauling with acquisition of world class equipment and an increase in the bed strength. 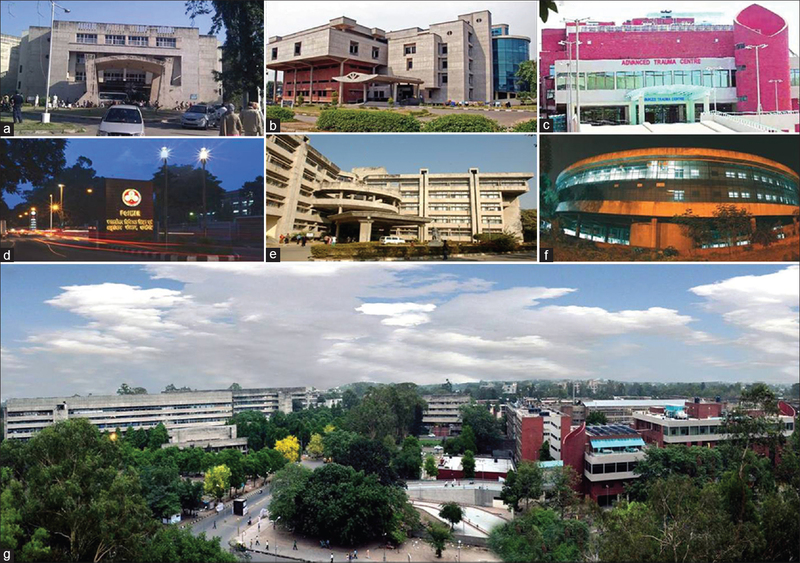 Together, these centers have changed the landscape of PGIMER, Chandigarh completely [Figure 5]. PGIMER Chandigarh, on completing 50 years of its service towards the nation, received another feather in its cap in January 2013, when India Post issued a Rs. 5 postage stamp featuring the Nehru Hospital to commemorate the golden jubilee celebrations of PGIMER [Figure 5]. The Department of Neurosciences was formally started in January 1962 with Dr. Des Raj Gulati [Figure 6] joining as Assistant Professor after his training from the Montreal Neurological Institute under Dr. Wilder Penfield. Neuroradiological investigations were started by Dr. JS Sodhi in 1962, and in 1966, the first electroencephalogram (EEG) machine was acquired. Dr. Gulati himself used to interpret all the EEGs and he started a seizure clinic in 1966. Neuropathology services were started in 1970 following the return of Dr. Ashru K. Banerjee after his training at Queen Square, London. 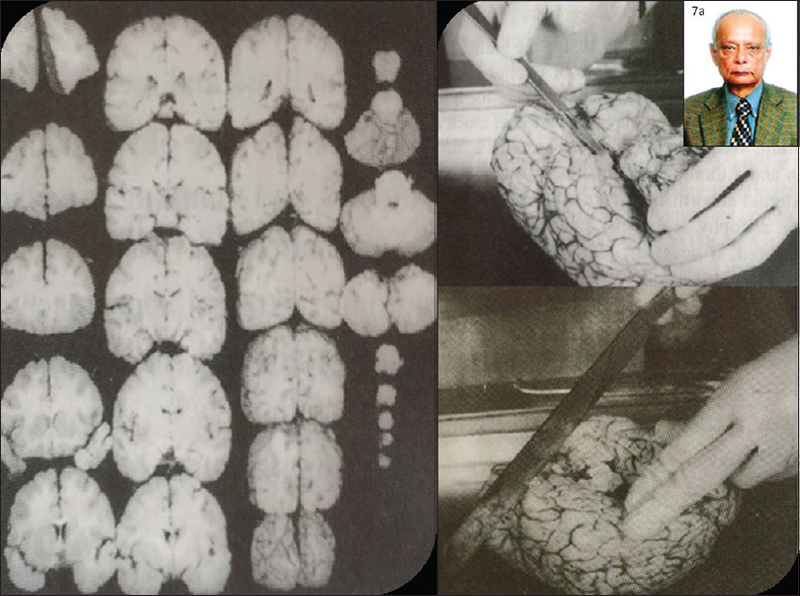 He was instrumental in starting the “brain cutting” sessions [Figure 7], which are religiously followed ever since then. Prof Gulati looked after both Neurology and Neurosurgery services till November 1968 when Dr. Jagjit Singh Chopra joined as Assistant Professor and established the Department of Neurology in PGIMER, Chandigarh [Figure 8]. However, the formal separation between the Departments of Neurology and Neurosurgery took place only in 1979, when Dr. Jagjit Singh Chopra was elevated to the rank of Professor of Neurology. The department also owes a debt of gratitude to its teachers namely Dr. ON Markand, Dr. Vimla Virmani, Dr. Baldev Singh and Dr. Anand Prakash for laying down the foundations of a vibrant department that is one of the foremost in its field. 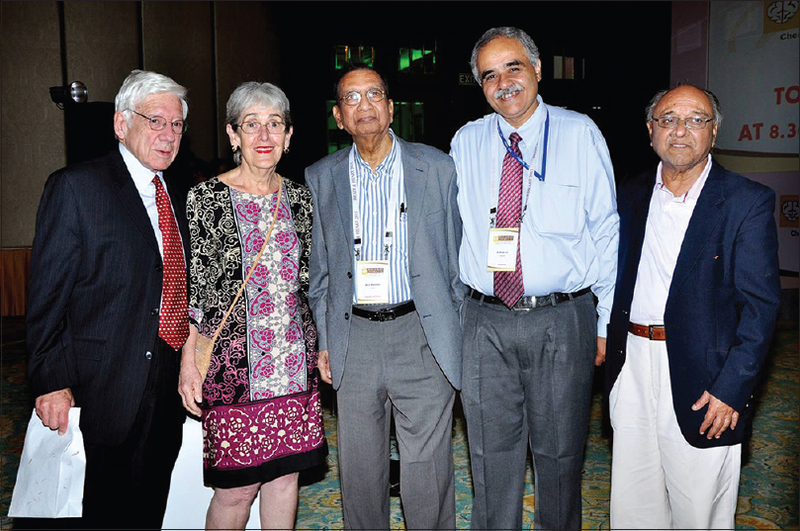 During the early years, Dr. JS Chopra was assisted in the functioning of the Department of Neurology by Dr. Krishan Chander (Assistant Professor; left in 1972), Dr. BB Sawhney (Lecturer; left in June 1975), Dr. NS Rao (Assistant Professor; left in 1974), Dr. NC Chaturvedi (Assistant Professor; left in 1974) and Dr. Sarasavani V Rao (Lecturer; left in 1978). Dr. Sudesh Prabhakar joined the department as Assistant Professor in 1979 and subsequently rose to the post of Professor and Head of the Department of Neurology. He retired in April 2014. 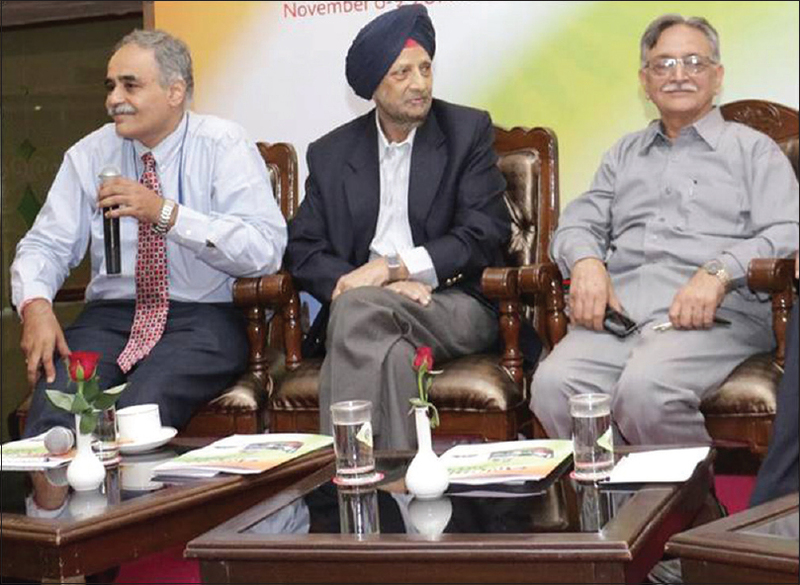 Subsequently Dr. K Radhakrishnan, Dr. Upinder Kaur, Dr. UK Dhand, Dr. IMS Sawhney and Dr. SK Bansal held various faculty positions and helped in shaping the department further. The current Head of the Department, Dr. Vivek Lal joined the department in 1991 as senior resident and rose to the post of Head of the Department of Neurology in 2014. The department has always strived for excellence, as indicated by its excellent academic traditions right from its inception. Even in 1971, the Neurology Department held one journal club per week, one subject seminar per week, a combined Neurology and Neurosurgery round every Saturday, Neuroradiology and Neuro-ophthalmology rounds once a week, as well as an electroencephalography conference once a week. 1578 EEG (electroencephalograms) were performed in the department during the year 1972. Electromyography and nerve conduction studies were first started in 1972 and about 250 patients were investigated during the same year. The Neurology Research Laboratory was established in the department during the year 1971 and research work on peripheral neuropathies was started in it during the same year. Ever since its inception, the outpatient clinical services have been followed as a religion by both the faculty and trainees of the Department of Neurology. 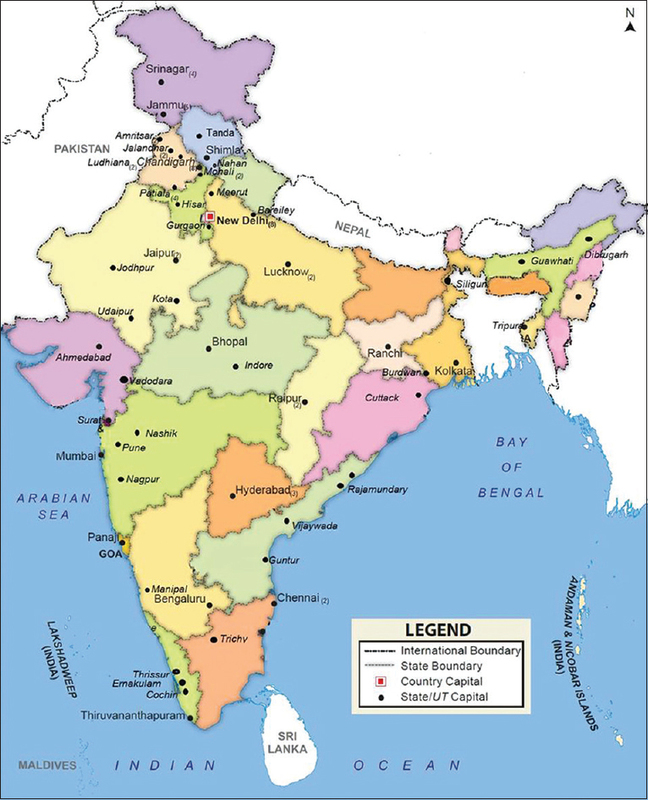 The department provides specialized neurological care to the northern states of India including Jammu and Kashmir, Punjab, Haryana, and Himachal Pradesh, with patients coming from as far as Uttar Pradesh, Rajasthan, Uttaranchal, Bihar and even the North-Eastern states of India. The enormous increase in workload can be gauged from an increase in the number of patients attending the OPD services from 7692 in 1972 to 10183 in 1980, 21592 in 1990, 23580 in 2000 and 74118 in 2015 [Figure 9]. The earlier OPD services were provided in Nehru Hospital itself (that had restricted space), until a new OPD block was inaugurated by the Union Cabinet Minister of India, Shri CP Thakur in 2001. During the earlier years, the OPD services remained uninterrupted even during national holidays, including 26th January, 15th August and 2nd October. However, during the year 2005, through a special act of parliament, OPDs were closed during the national holidays. During the earlier years, the OPD services used to finish at 1:00 pm. However, with increasing number of patients, the current OPD services are running until up to 5 pm or even 6 pm daily. To meet the demands of this ever-increasing number of patients and to provide specialized care, the department has started various subspecialty clinics. Refractory epilepsy clinic was started in 2002 where Dr. Vivek Lal and Dr. Parampreet examine patients. 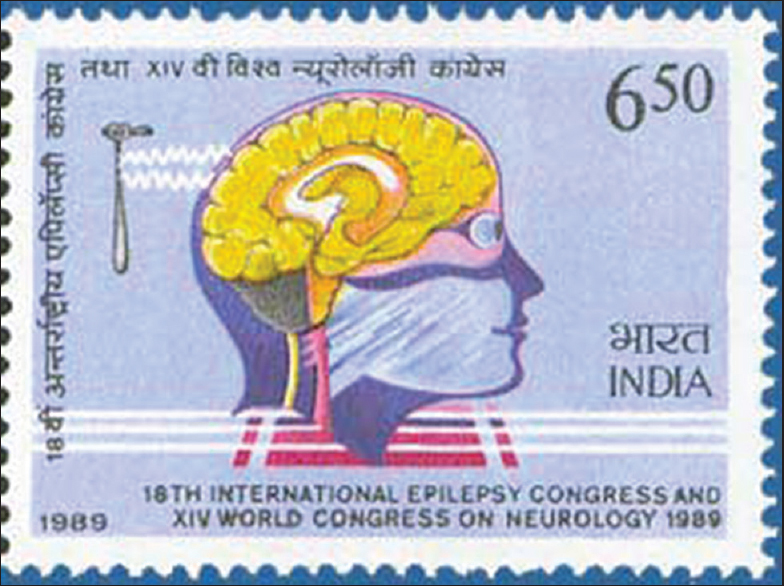 The first epilepsy surgery was performed in 2003, and till date, the department has performed close to 200 epilepsy surgeries. Comprehensive stroke program was started in 2002 and the first thrombolysis was performed on 5th Nov, 2002. Currently, we have an active state-of-the-art stroke program. Till date, 295 thrombolysis and 68 mechanical thrombectomies have already been carried out at the Department of Neurology. A specialized tuberculous meningitis clinic was started in 2011. This was later upgraded to the neuroinfectious disease clinic in 2016. Neuro-ophthalmology, movement disorder and multiple sclerosis clinics were started subsequently to provide specialized subspecialty care to needy patients. Similar to the increase in the number of patients seeking care from Neurology OPD, the number of indoor admissions have also increased from 423 in 1975 to 1140 in 2015. However, till date, we have the same number of inpatient beds (24) since the inception of the department. A proposed neuroscience center with a capacity of 110 Neurology beds is in pipeline. Budget has already been allocated by the government for constructing this facility. Initially, both the Departments of Neurology and Neurosurgery were run by Dr. DR Gulati with assistance from Dr. Vimla Virmani in Neurology. 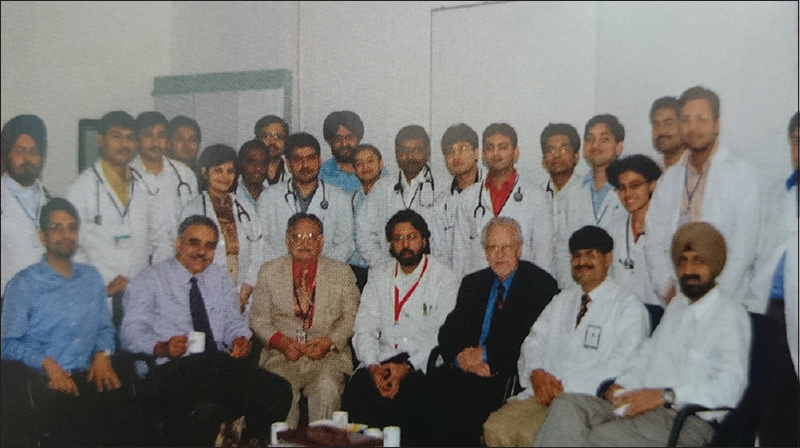 Other faculty members who assisted Dr. Gulati included Dr. OP Markand, Dr. Baldev Singh and Dr. Anand Prakash. The Division of Neurology came into separate existence with the joining of Dr. JS Chopra as Assistant Professor in 1968. Initially, he was assisted by Dr. Krishna Chander and Dr. BB Sawhney in 1970. However, Dr. Krishna Chander soon left the department. The faculty strength of the department rose to four in 1973 with the joining of Dr. NS Rao and Dr. NC Chaturvedi. However, by 1976, all the faculty members other than Dr. JS Chopra had resigned. During this period, Dr. Sarasavani V. Rao joined in 1976 and left the department in 1979. After 1979, the department got regular faculty with the joining of Dr. Sudesh Prabhakar, Dr. Upinder Kaur Dhand and Dr. IMS Sawhney. 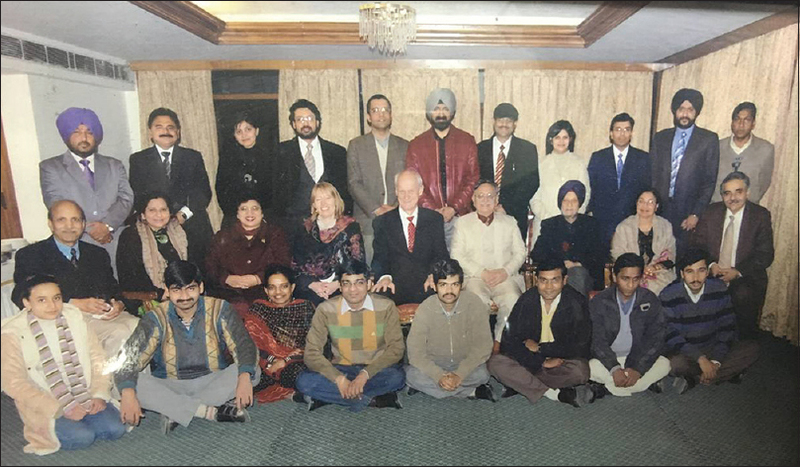 In the late 90s after Dr. Sawhney and Dr. Upinder moved out of the country, Dr. Anil Thussu and Dr. Vivek Lal along with Dr. C P Das and Dr. SK Bansal held faculty positions. Subsequently, Dr. Thussu moved to Kuwait while Dr. C P Das shifted to Australia. Dr. JS Chopra superannuated in 1995 and Dr. Sudesh Prabhakar superannuated in 2014. Later, other faculty members joined the institute and currently the Department of Neurology has seven regular faculty members working. For a brief period, Dr. Dipti, Dr. Awadh and Dr. Vishnu held faculty positions before joining All India Institute of Medical Sciences, New Delhi, as faculty members. 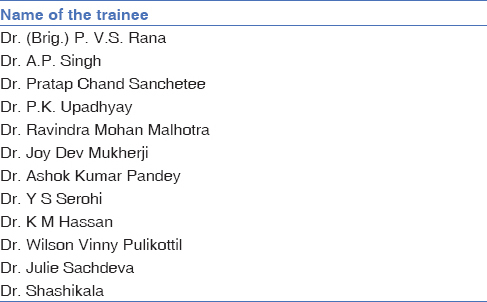 The names of all the faculty members who have done rounds in PGIMER, Chandigarh are given in [Table 1]. The DM (doctorate in medicine) Neurology program was formally started in January 1974. Dr. Baldev Raj holds the distinction of being the first DM trainee from the department. He completed his degree in December 1975. The second trainee Dr. PVS Rana was from the armed forces and is currently settled in Nepal. The training program at that time used to be of 2-year duration until 1996, when its duration was increased to 3 years with addition of a mandatory dissertation. The next three trainees (Dr. Sudesh Prabhakar, Dr. K Radhakrishnan and Dr. JMK Murthy) are all stalwarts in Neurology and headed three most prestigious Neurology institutes of our country namely PGIMER, Chandigarh, Sree Chitra Tirunal Institute of Medical Sciences, Trivandrum, and Nizam's Institute of Medical Sciences, Hyderabad, respectively. Dr. K Radhakrishnan was instrumental in starting and developing epilepsy program not only in Sree Chitra Institute, but in the entire country. His epilepsy fellowship program was the most sought-after fellowship program in the country for many years. Many other trainees from PGIMER Chandigarh have held positions of high esteem not only in India, but also abroad. 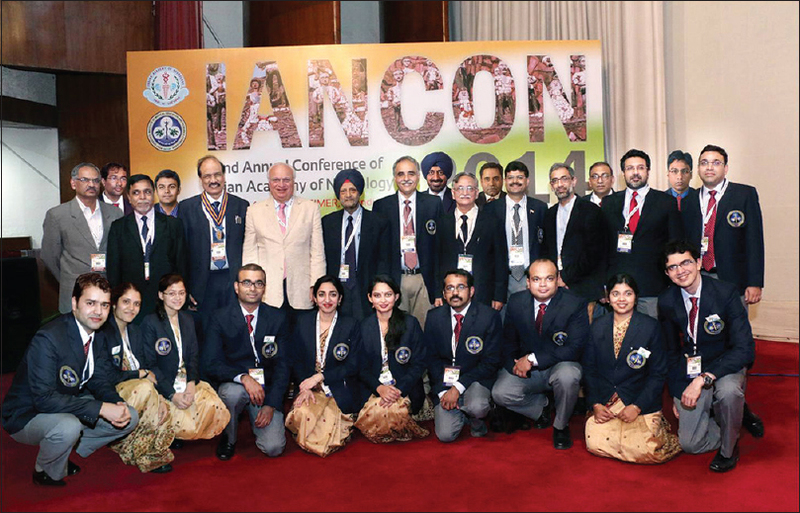 Dr. Kapil Sethi (DM in 1981) has been conducting the prestigious Neuro-Bowl event at the Annual Conference of the American Academy of Neurology. Dr. Ashok Panagariya (DM in 1982) superannuated as Head of the Department of Neurology at SMS Medical College, Jaipur. He also received the prestigious BC Roy award in 2003 and Padma Shri in 2014. 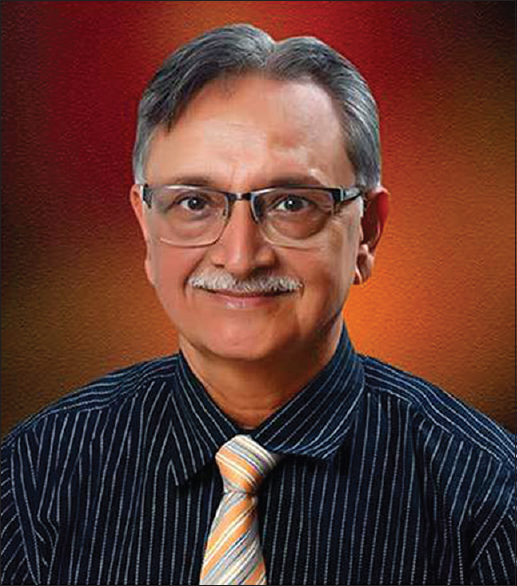 Dr. IMS Sawhney (DM in 1983) worked as a faculty member in PGIMER, Chandigarh, before seeking voluntary retirement in 2000. He is currently settled in the UK. His students still fondly remember him for his excellent clinical skills as well as helping attitude. He is still involved in many charity projects and donates generously to the Department of Neurology for helping poor patients. Dr. M Madhusudanan (DM in 1983) rose to the post of Professor in the Department of Neurology at Trivandrum Medical College and in known in the entire South India for his accurate clinical skills. Dr. Chandrashekhar Mesharam (DM in 1985) became the President of the Indian Academy of Neurology in 2014, while Dr. Ashok Kumar Kayal (DM in 1985) rose to the position of Head of the Department of Neurology at Government Medical College, Guwahati. Dr Shyamal Kumar Das (DM in 1985) is known in the entire Northeast India for his Neurology skills and rose to position of the Head of the Department at Burdwan Medical College, Burdwan. Dr Subhash Kaul (DM in 1990) rose to the position of the Head of the Department of Neurology at Nizam's Institute of Medical Sciences and Dean, Nizam's Institute of Medical Sciences, Hyderabad. He also became the President of Indian Academy of Neurology in the year 2016. Dr. Anil Thussu (DM in 1991) joined as a faculty member in PGIMER before seeking voluntary retirement. He is currently well settled in Kuwait. Dr Mushtaq Ahmed Wani (DM in 1993) is currently working as Head of the Department of Neurology at Sher-i-Kashmir Institute of Medical Sciences, Srinagar. Dr Gagandeep Singh (DM in 1993) is the current Head of the Department of Neurology at Dayanand Medical College, Ludhiana. He is also the current Secretary of the Indian Academy of Neurology. Dr. Ashok Uppal (DM in 1994) became the President of Indian Stroke Association in 2016. Dr. Parvaiz Ahmad Shah (DM in 1995) became the Head of the Department of Neurology at the Government Medical College, Srinagar. Dr. Vijay Sardana (DM in 1996) is currently the Head of the Department of Neurology in Government Medical College, Kota. Dr. Geeta Mohanty (DM in 1996) rose to the position of the Head of the Department of Neurology at SCB Medical College, Cuttack. Dr TN Dubey (DM in 1997) is the current Head of the Department of Medicine at Government Medical College, Bhopal. Dr CP Das (DM in 1997) worked as a faculty member in the Department of Neurology before shifting to Australia. He is currently well settled in Australia. Dr. Trilochan Srivastava (DM in 1997) is currently working on a faculty position in the prestigious SMS Medical College, Jaipur. Dr. Puneet Syal (DM in 1998) was a renowned neurologist in Chandigarh till we lost him untimely due to a natural cause. Dr. Dheeraj Khurana, Dr. Parampreet Singh and Dr. Manish Modi are all Professors in the Department of Neurology, PGIMER, Chandigarh. Dr Rohit Bhatia (DM in 2001) is currently the Professor of Neurology at the prestigious All India Institute of Medical Sciences (AIIMS), New Delhi. Dr Fijo Chako (DM in 2003) is currently the Professor of Neurology at Jubilee Mission Medical College, Thrissur. Dr. Preeti Sahota (DM in 2004) did Fellowship in Vascular Neurology from the University of Houston, Houston, USA, and is currently well settled in Chandigarh. Dr. RP Asimi (DM in 2004) is currently working as a faculty member at Government Medical College, Srinagar. Dr Simranjeet (DM in 2008) is currently working as a faculty member in the Department of Neurology, University of Manitoba, Canada. Dr. Parveen Kumar Sharma (DM in 2009) is currently working as a faculty member in the Department of Neurology, King George Medical University, Lucknow. Dr. Monika (DM in 2009) is a faculty member in the Department of Neurology at Dayanand Medical College, Ludhiana. Dr. Teresa (DM in 2011), Dr. Binod (DM in 2010), Dr. Kali P Swain (DM in 2011), Dr. Sudhir Sharma (DM in 2011), Dr. Amit Bhardwaj (DM in 2012) and Dr. Anu Gupta (DM in 2013) are working as faculty members in Goa Medical College, Goa, Assam Medical College, Dibrugarh, SCB Medical College, Cuttack, Indira Gandhi Medical College, Shimla, Rajindra Prasad Government Medical College, Tanda and G B Pant Medical College, New Delhi, respectively. Dr. Roopa Rajan (DM in 2014) and Dr. Vishnu VY (DM in 2015) are both Assistant Professors in the Department of Neurology at AIIMS, New Delhi. Dr Aastha (DM in 2015) is an Assistant Professor in the Department of Neurology at PGIMER, Chandigarh, while Dr. Sanath Bhatkar (DM in 2016) is an Assistant Professor in Goa Medical College, Goa. Till date, 141 students have been enrolled in the Department of Neurology, out of whom 132 have successfully obtained DM degrees in Neurology. The complete list of PGI alumini from the Department of Neurology is given in [Table 2]. In addition, the Department of Neurology also provides a three-month training to all the postgraduate students who are pursuing MD degree in the discipline of Medicine in PGIMER, Chandigarh. The Department of Neurology at PGIEMR, Chandigarh has contributed to Armed Forces Medical Corps by providing superspeciality training in Neurology to 12 medical personnel from the defense forces. 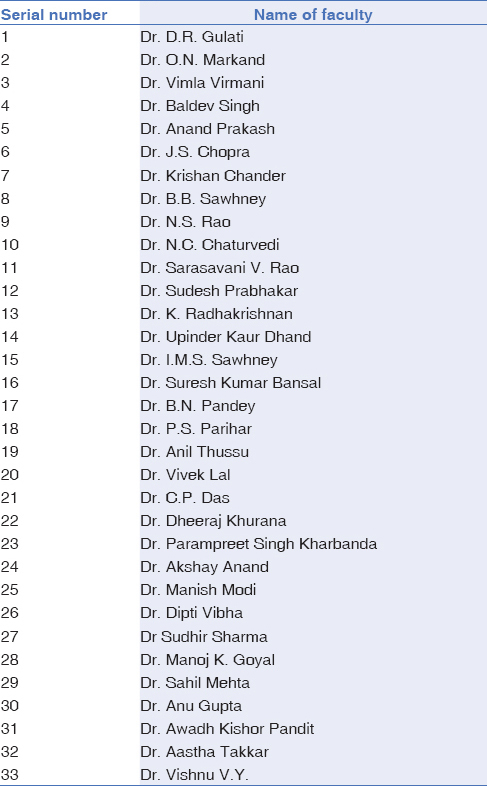 The list of the personnel from the Armed Medical Corps who have obtained doctorate degree from PGIMER, Chandigarh is given in [Table 3]. The first EEG machine was installed in the Department of Neurosciences in 1966 and Dr. Gulati himself used to read and report EEGs with unmatchable accuracy. The first electromyography (EMG) was carried out in 1972. Subsequently, new EMG machines were acquired in 1974 (one) and 1984 (one) respectively, and new EEG machines were acquired in 1977 (one) and 1984 (one). The neurophysiology laboratory was formally inaugurated in 1985 by Mrs. Mohsina Kidwai (the Union Health Minister of India) [Figure 10]. By 1991, the department had three EEG machines and two EMG machines. While Dr. JS Chopra used to report EEGs during the 1980s, Dr. IMS Sawhney started reporting EEGS during the 1990s. Even today during rounds, Dr. Lal and other senior faculty members speak of the high quality of EEG reporting and EEG cues given to senior residents by Dr. IMS Sawhney. One of his favorite statements was, “slow waves are more dominant posteriorly in uremic encephalopathy, whereas in hepatic encephalopathy, these are more dominant anteriorly.” During the time of Dr. JS Chopra, a consultant would sit for the whole day in the EMG lab and report the EMG findings. However, with an increase in the patient workload, this practice was abandoned, and currently the senior-most senior residents are manning the EMG laboratory in consultation with a faculty member, who is posted by rotation. The current electrophysiology system (consisting of 2 video EEGs machines, three routine EEG machines and two EMG machines) was procured in 2008. The strength of technicians gradually increased from 3 technicians in 1995 to 10 at present. The number of tests conducted by the department also increased exponentially over the years. While there were only 250 EMGs and 1578 EEGs performed in 1972, the number increased to 902 EMGs and 2062 EEGs during 1989. 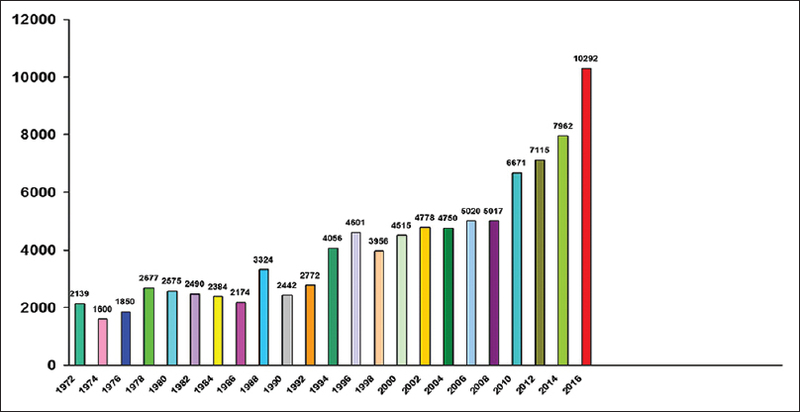 The total number of EEGs and EMGs jumped to 6671 in 2010 and 8757 in 2015 [Figure 11]. The department has contributed more than 750 research papers and case reports to various national and international journals of repute and has contributed more than 75 chapters in various books. In 1969 itself, the department published 12 papers. In 1979, as an independent Department of Neurology, the department published 29 papers. 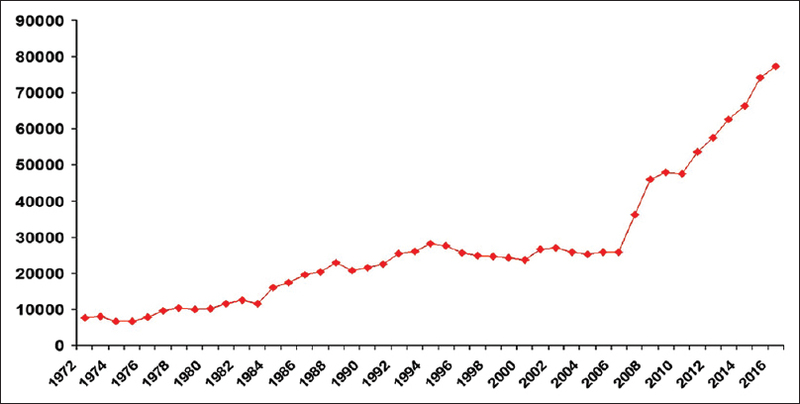 There was a decrease in the number of publications during the years 1990-2010. During this period, the department published an average of 10 papers per year. However, since 2014, the department has been publishing more than 30 papers per year with the number reaching 39 in the year 2016. Some of the pioneering works carried out by the department include studies on electrophysiology and pathology of diabetic neuropathy as well as paralytic rabies in the 1980s by Dr. JS Chopra, the first description of the wasted leg syndrome by Dr. Prabhakar in 1981, the note on neurological complications of acute hemorrhagic conjunctivitis and clinical spectrum of craniovertebral anomalies by Dr. Chopra in 1986 and 1988 respectively, and the pioneering work done by Dr. Lal on neuro-ophthalmology and migraine including the first description of ophthalmoloplegic migraine in 2007 and the detailed description of the largest prospective series of patients with cavernous sinus syndrome in 2017. The department has successfully hosted many national and international conferences. 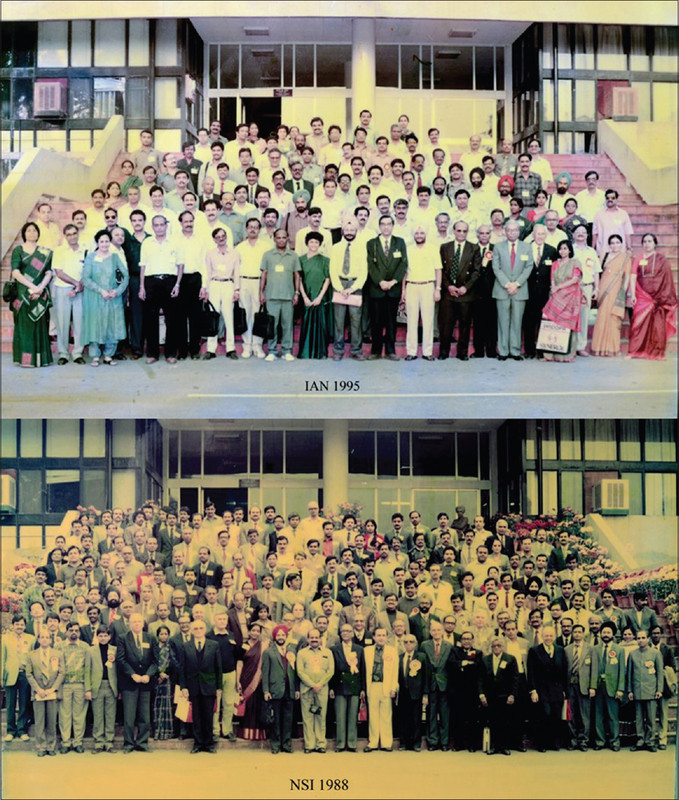 The department has hosted the annual conference of Neurological Society of India twice in the years 1988 and 2003, respectively [Figure 12]. 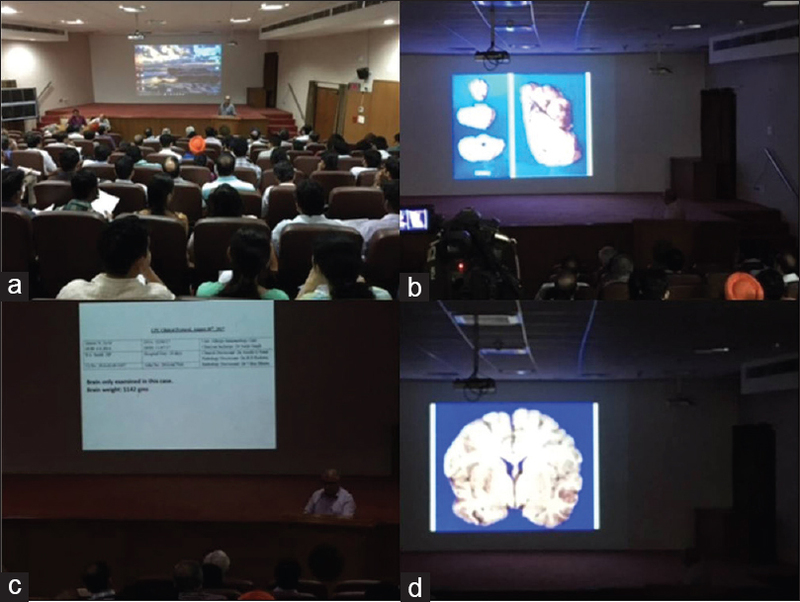 It has also hosted the annual conference of Indian Academy of Neurology twice in the years 1995 [Figure 12] and 2014 [Figure 13], respectively. These conferences were very well attended with both national and international faculty members educating the delegates on various topics of interest. All these four conferences were very successful and set a benchmark for future conferences. 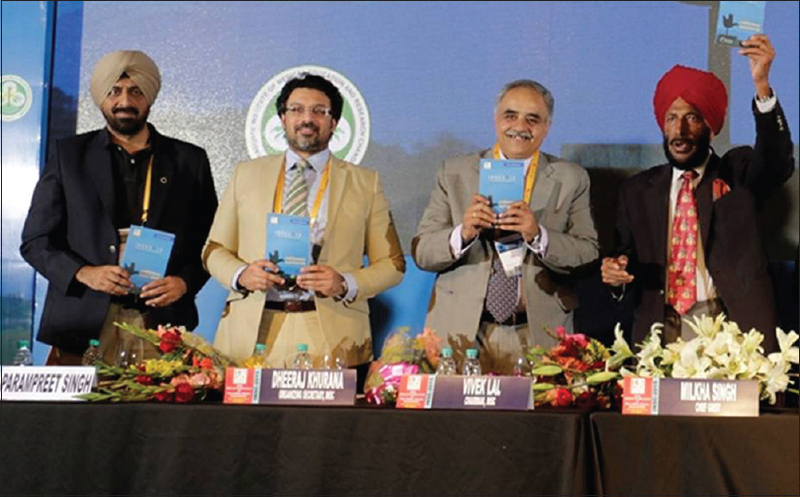 The department also hosted the XIV World Congress of Neurology at Delhi in 1989, which was again a grand success. To commemorate this event, the Government of India released a postage stamp [Figure 14] adding another feather in the cap of our department. In addition to these major conference, the department has also successfully hosted many other conferences. 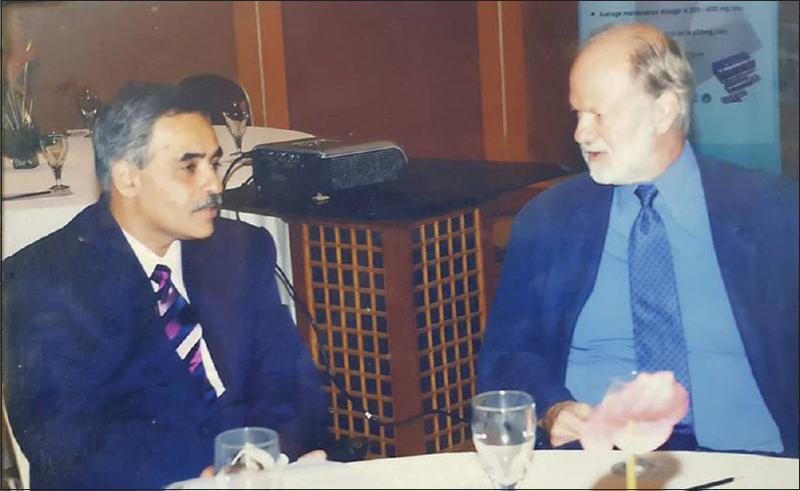 In 2007, the department successfully hosted the Indo-Pakistan Neuroscience Colloquium and the International symposium on Epilepsy. 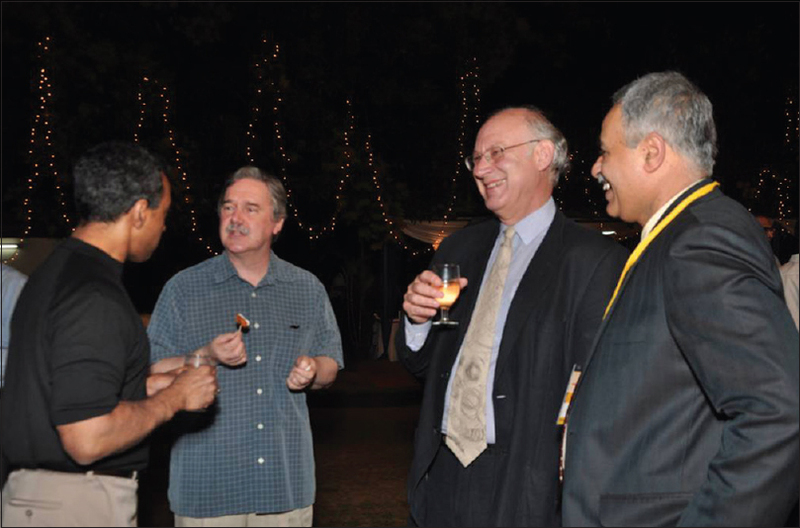 In 2009, the department successfully hosted the National Conference on Tropical Neurology (TROPICON 2009). The 1st National Conference of Neuro-ophthalmology was successfully hosted in the department in March 2013. 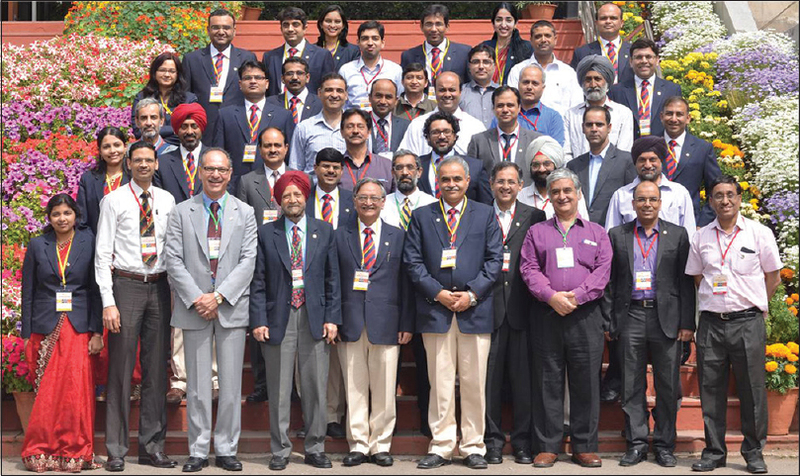 The Indo-US program on Comprehensive Stroke Center Training was held in 2010 and the 10th Annual Conference of Indian Stroke Association was held in March 2015. In addition, many stalwarts in the field of Neurology have visited PGIMER, Chandigarh from time to time. Dr. Louis Caplan visited the department in 1998, and ever since then, he shares a special bond with the department. Other world-famous Neurology teachers who have visited the department include Dr. Jes Olesen, Dr. Walter Bradley, Dr. E Wyllie, Dr. John Duncan, Dr. Raad Shakir, Dr. S Shorvon, Dr. Jerome Engel, Dr. Gordon Plant, Dr. Christopher Kennard, Dr. CT Tan, Dr. Allen Hauser, Dr. Andrew Charles, Dr. Alistair Compton and Dr. Prem Subramanian [Figure 15], [Figure 16], [Figure 17], [Figure 18], [Figure 19], [Figure 20]. Dr. Jagjit Singh Chopra, the founder father of the Department of Neurology at PGIMER, Chandigarh was born in Lahore (now in Pakistan). He graduated in Medicine from the Government Medical College, Patiala. After completing his house job from Rajindra Hospital, Patiala, he left for the UK for further studies and obtained a Diploma in Child Health from the Royal College of Physicians, London and MRCP (Membership of the Royal College of Physicians) in 1963 from Edinburgh with specialization in Neurology. He further obtained PhD from Queen's University of Belfast (UK) in 1967 and did research on diabetic neuropathy. He was the youngest Indian physician to obtain the FRCP (Fellowship of the Royal College of Physicians) in 1969. In addition to his academic excellence, he is fondly remembered in the department for his strict and uncompromising attitude especially with regard to discipline and punctuality. Even the mere name of Dr. JS Chopra is sufficient to stall fear in the hearts of residents and faculty alike, even today. Dr. J S Chopra contributed immensely in the field of Neurosciences and published 235 scientific papers in various national and international journals of repute. He was instrumental in persuading Dr. Kak (former Head of the Department of Neurosurgery) to join PGIMER, Chandigarh. They have both shared a close bond. He has been the Chief Editor of the book entitled “Neurology in Tropics” whose 2nd edition was published in 2015. He is the Founder President of the Indian Academy of Neurology and the Past President of Neurosurgical Society of India. He was the first Indian neurologist to be selected as the Secretary General of XIV World Congress of Neurology held in 1989 at New Delhi. He has been a Visiting Professor/Guest speaker to 56 institutions, mostly abroad and on the Editorial Board of several journals of international repute. 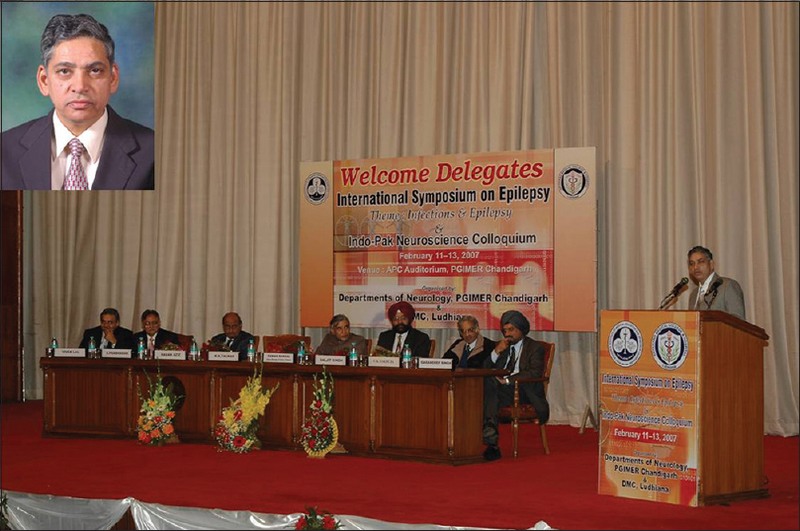 Dr. Chopra has been an invited speaker at several international conferences held in India and abroad. His biography has been cited in Who's Who India, International Book of Honour, Asia International Men and Women, American Biography Institute's Great Minds of 21st Century, Top 100 Professionals 2010, International Biographical Centre, Cambridge, Marquis Who's Who, 2011 from 1980 over 30 times. He has received the Man of the Year 2001 award; as well as the Bharat Jyoti award by the India International Friendship Society. Dr. Chopra has the distinction of having been associated with the World Federation of Neurology from 1985 till date in various capacities. He has been a member of the Executive Committee of the International Federation of Clinical Neurophysiology; selected as Honorary Member of American Academy of Neurology and American Neurological Association; Member, London Medical Society; Association of British Neurologists, Ulster Medical Society, etc., He was elected Fellow of the Medical Society of London and the National Academy of Medical Sciences (India), New Delhi. He was awarded life-time achievement award by the World Federation of Neurology in 2017. He has received numerous awards and orations. Most prestigious among them are: Dr. BC Roy National Award, 9th Amrut Modi Research Award, Pelipu Perindevi Suriya Award, Pharmacological Society of India MS Sen Oration Award, Indian Council of Medical Research award, Life Time Achievement Award in Neurosciences, Madras Neuro Trust oration, Dr. MS Sanjeev Rao oration, Dr. NK Gupta oration, Dr. RS Allison Belfast, UK oration, Dr. Baldev Singh oration, Neurological Society of India oration, the National Academy of Medical Sciences, New Delhi 2010 oration, the 3rd King Edward Memorial oration, the Department of Neurology, Government Medical College, Kota oration, the Vishist Chikisha Gold Medal by Association of Chest Physicians of India, the award by Pan Arab Union of Neurological Societies, Emirates Medical Association and Emirates Neurological Society and Emirates League against Epilepsy award, and an award by Pakistan Neurological Society. 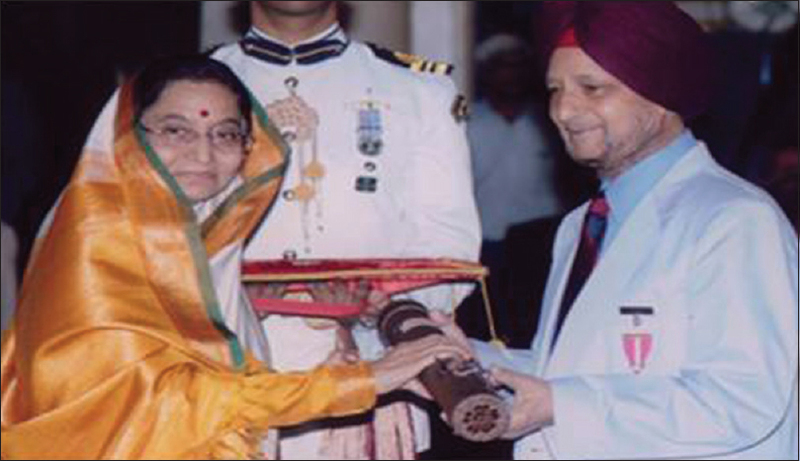 He was awarded Parman Patra by Mr. Prakash Singh Badal, the Chief Minister of Punjab in 2007. He was awarded Padma Bhushan by the President of India in 2008 [Figure 21]. Born on 14th April, 1949 at Jullundur (Punjab), Dr Sudesh Prabhakar [Figure 22] did his MBBS (Bachelor of Medicine and Surgery) from Rohtak in 1971 and completed his MD (Doctor of Medicine) in Medicine and DM in Neurology from PGIMER Chandigarh in 1978. 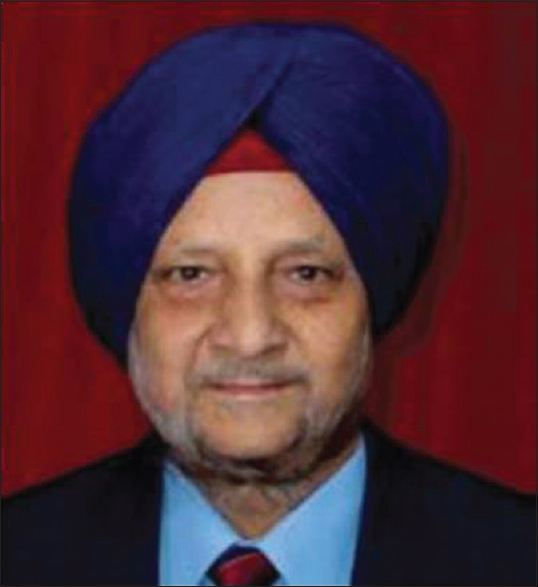 He joined PGIMER Chandigarh as Assistant Professor in 1980 and subsequently rose to the post of the Head of the Department in 1995, which he held till his retirement in 2014. In addition to being an excellent academician and teacher, he was also an avid researcher. He published more than 200 papers in various national and international journals of repute and contributed chapters to many books. Dr. Prabhakar was elected as Chief Editor, Neurology India, the official journal of Neurological Society of India for a period of 6 years from 1997–2002 during which time 'Neurology India' was indexed in Index Medicus and MEDLINE. He was co-editor of the Text Book of Neurology, which was published in January 2001. He has edited a book titled “Taenia Solium Cysticercosis from Basic to Clinical Science” and was editor of the (i) Annual Report of the Postgraduate Institute of Medical Education and Research, Chandigarh, and (ii) 'Reviews in Neurology'— a continuing medical education program book of the Indian Academy of Neurology for a period of 3 years from 2006–2008. Dr. Prabhakar's basic interest is 'stroke in young' and 'headache' which he has been pursuing since 1975. He has developed a module for managing acute cases of stroke in the absence of specialized and sophisticated “stroke units” with equally effective results. He has studied the role of prothrombotic state and genetic factors in the causation of stroke in the young and has found genetic defects that may be responsible for producing protein C and protein S deficiency. He has also been instrumental in the development of the molecular laboratory and stem cell program in the management of cases of stroke and amyotrophic lateral sclerosis (ALS) seen in PGIMER, Chandigarh and in other northern states. He has also helped in starting the molecular diagnosis and genetic studies in Parkinson's disease and ALS. Dr. Prabhakar has contributed immensely to the development of Neurology in India by serving as an advisor for the upgradation of the Neurology departments in various state medical institutes and tertiary medical institutes being funded and supported by the Government of India. In addition, he is also involved in spreading public awareness regarding neurological disorders through radio and television talk shows. The history of the Department of Neurology, PGIMER Chandigarh is marked by great heights achieved by many of its alumini. The department alumni have received one Padma Bhushan award (Dr. JS Chopra), one Padma Shri award (Dr. Ashok Panagariya) and two BC Roy awards (Dr. J S Chopra and Dr. Ashok Panagariya). 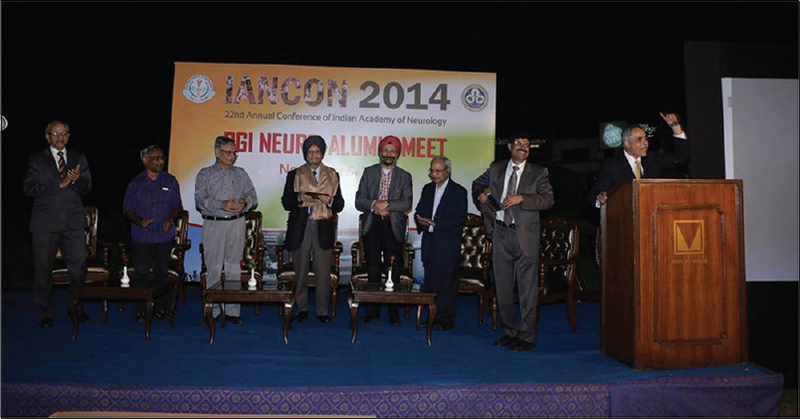 Six of the past Presidents of Indian Academy of Neurology have been departmental alumini, namely Dr. JS Chopra, Dr. S Prabhakar, Dr. K Radhakrishnan, Dr. Ashok Panagariya, Dr. Chandrashekhar Meshram and Dr. Subhash Kaul. 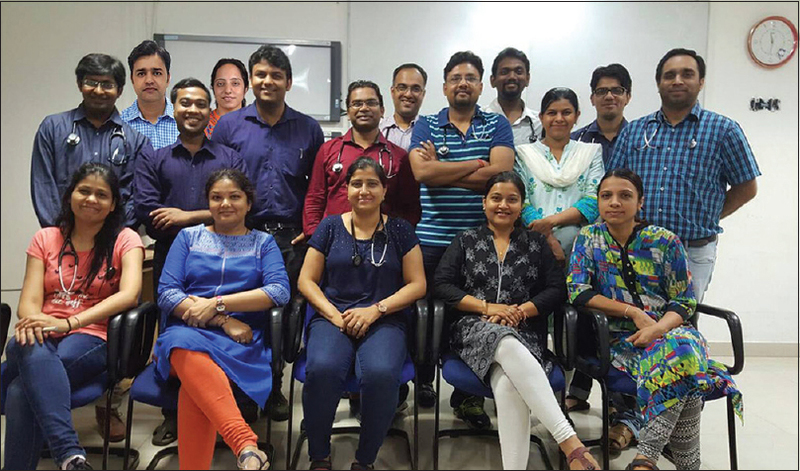 Many PGI alumini opting for private practice have made a name for themselves in social circles and many others who opted for academics have either headed or are heading departments of Neurology at various national and state medical colleges. All these members of the department have contributed to the present stature of the Department of Neurology, PGIMER, Chandigarh and we are thankful to all of them for giving their heart and soul for the welfare of the department. Some of the fond memories of various PGI alumni are depicted in [Figure 23], [Figure 24], [Figure 25], [Figure 26], [Figure 27], [Figure 28]. One of the key academic meets which sets PGIMER Chandigarh apart from all other institutes of our country is the clinical-pathological conference, which is carried out every Wednesday in the lecture theatre complex of PGIMER and is relayed live to many other institutes in the country. This CPC meet is carried out only on patients who have undergone autopsy in PGIMER, Chandigarh. A faculty member is given a clinical case which he/she prepares in detail. During the first 20 minutes or so, every clinical aspect of the patient is discussed in detail including all antemortem investigations such as pathology, radiology and biochemistry. During the next 10 minutes or so, various faculty members make comments on clinical/investigational details and discuss the differential diagnosis. Finally, for the next 20 minutes the pathologist-in charge reads out the final autopsy findings and then the entire congregation of doctors in the house discusses the case again. The CPC meet is ranked very highly among the various academic activities of PGIMER, Chandigarh and is attended by the entire faculty and trainees of the institute [Figure 29]. Another tradition which is followed religiously in PGIMER, Chandigarh is its convocation where students are awarded degrees for all the hard work they have done in the PGIMER corridors. Some of the proud moments in the history of the convocations of PGIMER, Chandigarh are depicted in [Figure 30]. Pictures of the Neurology Department, current senior residents in the Department of Neurology and the statewise presence of PGIMER Neurology alumuni are given in [Figure 31], [Figure 32], [Figure 33] respectively. “All that glitters is not gold,” the idiom holds true for the Department of Neurology, PGIMER, Chandigarh also, albeit to a small extent. The department is facing the problem of addressing the need for catering to the ever increasing number of patients with just 24 general ward beds at its disposal. The bed strength has remained the same for 40 years since the Department of Neurology formally separated from the Department of Neurosurgery. Though a neuroscience center with a proposed Neurology bed strength of 130 is in the pipeline and budget has already been allocated for the same, it has been caught in red tape for quite some time. Hopefully, with efforts from the current Head of Neurology (Dr. Vivek Lal) and Neurosurgery (Dr. Sunil Kumar Gupta), it will soon start providing services to the nation. The department also feels an urgent need to start a state-of-the-art Neurogenetic laboratory as well as Neuropathology, Neuromicrobiology, Neuroimunology, Neurovirology and Neurochemistry services. Though with the efforts of Dr. Vivek Lal, many of these projects are already in the pipeline, the final shape provided to these services to enable them to reach to levels of academic excellence will be achieved with the start of the proposed neuroscience center. The department also aims to strengthen community services and train medical officers from the neighboring states of Punjab, Haryana and Himachal Pradesh for providing efficient Neurology services as this will help in both reducing the patient load in PGIMER Chandigarh and in providing better patient care services in the neighboring states. Though there have been some steps taken by the department in this regard, these initiatives are far from enough and the department is trying to find ways to cope with this problem. To overcome the existing faculty shortage, the department has already asked for eight more faculty positions, which hopefully will be sanctioned soon. The department will be able to start community based services also in the near future. To conclude, the Neurology Department at PGIMER, Chandigarh takes pride in providing immense service to the nation both in terms of quality patient care and research. We hope that this article on the history of this esteemed institute and department will not only stimulate the existing faculty of PGIMER, Chandigarh, to set higher goals for themselves in the future, but also act as a catalyst for other medical professionals in the country to achieve greater heights. Enjoyed every moment of my working in PGI especially with most brilliant residents and senior residents whom I might have scolded for their interest and for their bright future. I always treated them like my children. Interaction with Prof. Rasmussen when he came as Visiting Professor to PGI. When I mentioned my home state to be Assam, he could immediately recall places in Assam where he had worked as a Medical Officer with the Allied troops during World War II. In the OPD, I was presenting a case of dementia to Prof. Chopra whose back was towards me. When he finished washing his hands, he turned around. With just one glance towards the patient he said “Huntington's Chorea.” Such was his clinical acumen, and speed and sharpness of intellect. Bonfire at Dheeraj's house and singing with Parampreet, Modi, Reddy, Rohit. Shreekanth. Loved the way Dr. Lal used to help poor patients and, of course, us also; Loving to be on rounds with Dr. Prabhakar and Dr. CP Das. The Tuesday tea breaks with kathiroll and dhokla after the grand grilling in clinical presentations. And finally, we pay our gratitude to all the eminent personalities and our teachers under whose guidance and vision, our esteemed institute, PGIMER, Chandigarh, was started and nurtured to bear fruits of success and glory.